I really believed there would be a conflict using the PS2 controller with the RFM12 modules, since they both use SPI. But the great thing is that Bill Porter wrote the PS2X library so that the pins are changable, aka software SPI. So the RFM12B can use hardware SPI, and the PS2 can use its software SPI bit banging. The only thing I had to modify in the PS2X library was the read_delay variable in the config_gamepad function (I increased it to 3). After that, the controller gets recognized as a Dual Shock 2 controller, with full analog on all 12 buttons, 2 joysticks, and 4 analog buttons (start, select, L3, R3). To learn how the RF12 Library from JeeLabs works, I modified the RF12demo sketch to send a packet when I pressed ‘x’ in the serial terminal of the arduino with the PS2 controller. It then sends the values of all of the buttons (I forgot start and select) to the remote arduino. The RF12 library is pretty powerful, letting you reconfigure the modules for different channels and everything else. Regarding backups, I have it pretty much figured out, just not implemented. I settled on using Windows XP for my main computer, since it is very fast. A side effect is that I’m finding that both of my USB to serial cables are working perfectly. I’ve attached the example code below, so feel free to give it a try! It is mostly the RF12demo sketch, utilizing the PS2X library to get button values. total sketch size is 10612 bytes.
" <nn> i - set node ID (standard node ids are 1..26)" "\n"
" (or enter an uppercase 'A'..'Z' to set id)" "\n"
" <n> b - set MHz band (4 = 433, 8 = 868, 9 = 915)" "\n"
" <nnn> g - set network group (RFM12 only allows 212, 0 = any)" "\n"
" <n> c - set collect mode (advanced, normally 0)" "\n"
" t - broadcast max-size test packet, with ack" "\n"
" ...,<nn> a - send data packet to node <nn>, with ack" "\n"
" ...,<nn> s - send data packet to node <nn>, no ack" "\n"
" <n> q - set quiet mode (1 = don't report bad packets)" "\n"
case 'x': //PS2 controller packet. This entry was posted in PS2, RFM12B by dustinrobotics. Bookmark the permalink. Unless the PS2 has the USB drivers to handle PS3 controllers, then I don’t think that you’ll be able to use a PS3 controller on a PS2. To convert the PS3 wireless bluetooth to PS2, you would need the equivalent of a Arduino and a USB host shield with Bluetooth dongle. You would then have to convert what you receive via bluetooth, to SPI packets, with the Arduino acting as a SPI slave. That sounds like a lot of work, especially when you can get something like this for $12. 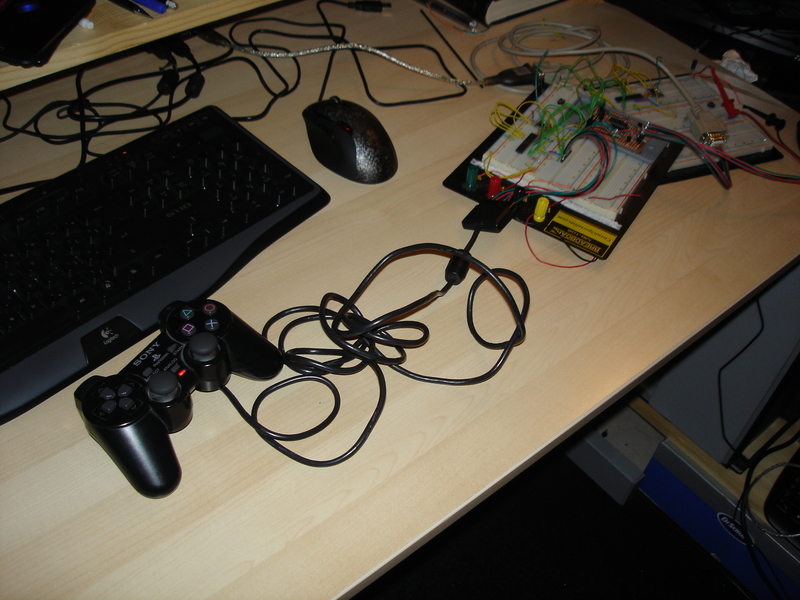 I wonder if the PS3 controller is SPI converted to USB or no SPI at all? I’m not sure that it really matters. All we can see is the USB/Bluetooth interface. Sure, we can take apart the PS3 controller and figure out how it ticks, but unless you want to modify it, it would be better to stay with either USB or the Bluetooth interface. For the controllers I use (Nunchuck, PS2), I stay with using the normal interface, since I want it to be easily replaceable if something breaks. A PS2 controller would be easier and simpler to use than a PS3 controller, thanks to Bill Porters Library.